Daymark's cloud services are designed to help companies optimize cloud economics. We deliver solutions that are scalable, customizable, secure and – most of all – cost effective. As part of every cloud services engagement, our experts will consult with you to provide a deep understanding of the technology, economics, and future benefits. Microsoft Office 365 enables organizations to leverage the cloud for unparalleled collaboration and productivity. 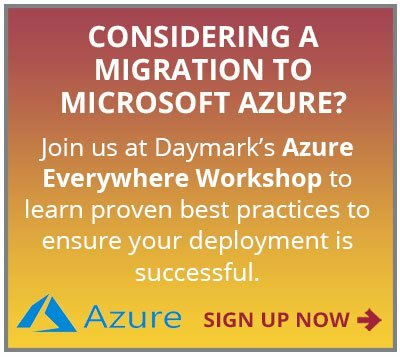 Daymark Microsoft-certified consultants can provide a path to a smooth migration. Learn how. As a Microsoft Tier 1 Cloud Service Provider, we offer design, deployment and on-going management of Microsoft Azure. We can help your team jumpstart the adoption of a cloud platform with Azure - in as little as one week. Learn how. Our goal is to architect a cloud to meet your current and future requirements. Built on vendor-agnostic, state-of-the-art technology, we’ll provide enterprise-class scalability, performance, availability and security, together with the customization and control you want. Learn how you can have cloud the way you want it. Learn more. By partnering with leading cloud vendors, we architect highly customized cloud solutions for our clients that meet their strategic business goals.